Jiangxi Xuxingyi Apparel Accessories Co., Ltd.
Heat transfer label also very easy to do, you can use heat press machine with correct time, temperature and pressure. 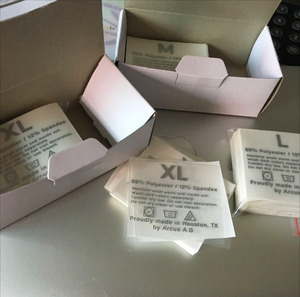 2) ,How long my heat transfer clothing label can be finished after order9 Around 3-7days, different quantity, different time. 4), Do you also do clothing hang tags9 We are professional about hang tags, you can choose styles on our website. material transfer printing film pet, heat transfer ink, flocking etc. usage widely use for t shirt, baby clothes, athletic gear, swimwear, underwear, gloves , bags, shoes, hats, gifts, luggage, toy, towel products, home textiles etc. the heat transfers are easy to apply by a regular household iron or an industrial heat press (recommended for best results). we can also source full-color heat transfer printing. High quality and eco friendly cartoon silicone badge P roduct Name Hot sale 3d rubber heat transfer logo label for garments Material 100%polyster /cotton, nylon,twill, woven fabric, canvas,felt, silk, PVC,silicone,leather,metal, etc Workmanship E mbossed, Debossed/2D/3D, Embroidery, Print, HF, Macromolecule , Heat Transfer, Woven and so on. Size Adjustable as per client's demand C olor Adjustable as per client's demand Design Any normal or special design, with logo embossed, or printed, and so on as per customers&rsquo; requirement. Label badge show Name Nanjing Yizhijin Garment Accessory Factory Founded In 1980s' Location Nanjing City, Jiang su Province Area 18000 Square Meters Employee 300 Experienced wokers,30 technicians Office 10 Offices,Such as Beijing,Shanghai,Hangzhou etc. Eaily to be transfered; 3). Time: 6-10 seconds 3). 5 days for sample 2). Suzhou Chuanhai Garment Accessories Co., Ltd. 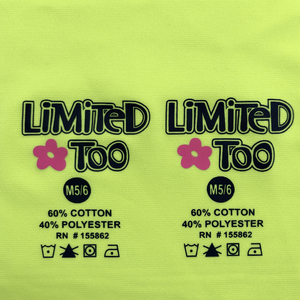 Customized Tagless heat transfer clothing label Factory Direct Sale UNIFLYING is a professional rhinestone heat transfer manufacturer in china . What content of fabric can be applied you heat transfer product9 Normally,our heat transfer printing products can apply on most of the fabric. What is the delivery cost9 Air forwarder or extra transportation expenses are not included in the unit price. Q7). Jinjiang City Feel Garment Accessories Co., Ltd.
heat transfer can be washable, soft, eco, do as your request. they are all customized,we are not responsible for the above pattern propety rights. however if this is not possible, our designer can make the artwork. JinJiang XingKe Garment Accessories Technology Co., Ltd. The heat transfer tags are Pantone color matched, with flexographic ink. They are silk screened onto a clear velum backing and come pre-cut and ready to apply. 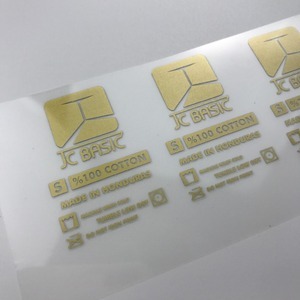 Heat transfer labels are best on sporty t-shirts, athletic wear, or baby items like newborn bodysuits. Dongguan Changping Xing Sheng Printing Fty. *cut each label one by one. *brand information i protected in good condition. Shanghai Green Goods Co., Ltd. It is widely applied for all kinds of cildren,men's clothes,very easily to operate. 3. It is suitable for printing on T-shirt, jeans,kinds of garment. 6. We can make the transfer films according to your pictures or photos. Dongguan Qingmei Professional Trade Co., Ltd.
about us professional inspection department to guarantee quality.oem is our main production mode. free for real samples, but freight cost. Guangzhou GAM Clothing Trade Co., Ltd.
Dongguan Menglan Garment Accessories Co., Ltd.
Jiaxing Jiufu Printing Technology Co., Ltd.
Alibaba.com offers 747 eco friendly heat transfer tagless label products. About 73% of these are garment labels, 1% are packaging labels. A wide variety of eco friendly heat transfer tagless label options are available to you, such as bags, garment. You can also choose from plastic, silicone, and cloth. As well as from main labels, care labels. And whether eco friendly heat transfer tagless label is free samples. There are 652 eco friendly heat transfer tagless label suppliers, mainly located in Asia. The top supplying countries are China (Mainland), Taiwan, and Hong Kong, which supply 96%, 2%, and 1% of eco friendly heat transfer tagless label respectively. 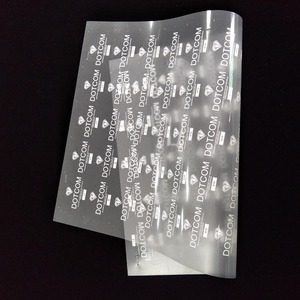 Eco friendly heat transfer tagless label products are most popular in North America, Domestic Market, and Eastern Europe. You can ensure product safety by selecting from certified suppliers, including 61 with ISO9001, 35 with ISO14001, and 31 with Other certification.